Tycho Brahe is exhumed in order to figure out how he died – was it a bladder infection or mercury poisoning? DANISH AUTHORITIES have exhumed the body of the country’s most famous astronomer – who died 409 years ago – in an bid to finally solve the mystery of how he died. Tycho Brahe, the country’s best known astronomer who died and was buried in Prague in 1601, was considered his country’s foremost authority on all things unworldly, being accredited with the discovery of over 1,000 stars. Such was his repute that Brahe became something of a celebrity of his era, widely known in both Denmark and then-Bohemia – as much for the metallic plate at the top of his nose (covering a wound incurred in a duel while at university in 1566) as his scientific exploits. It was for many years believed that Brahe had died from a bladder infection – one widely-told variant of his demise, the BBC reports, was that his bladder had exploded at a royal banquet, while it is more likely that he had contracted a bladder infection after politely refusing to leave the banquet. One myth, however, had offered that Brahe was actually been killed by Christian IV, the King of Denmark at the time, because Brahe had allegedly been involved in a relationship with his mother, Queen Sophie. Those rumours were given more substance when a lock of Brahe’s famous moustache was tested in the 1990s, and appeared to show signs of mercury poisoning – giving creedance to the idea that Christian had befriended Brahe’s unpopular cousin and had him poison Tycho’s drink. As a result, authorities have elected to exhume the body from its burial site in Prague and see if the science of 2010 can identify what the science if 1601 was unable to do: find an exact cause of death. A team of forensic scientists will spend until Thursday taking samples from Brahe’s remains, though the results of their tests are not expected until next year – meaning the mystery of Tycho Brahe’s death may continue for some more time at least. 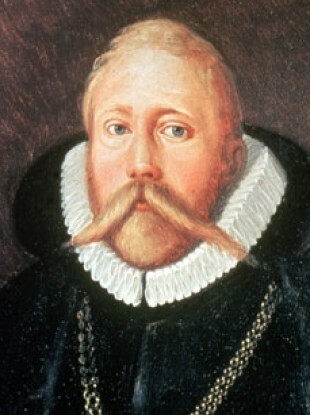 Email “Danish astronomer exhumed... after 409 years”. Feedback on “Danish astronomer exhumed... after 409 years”.